All faiths and religions have identifying characteristics that distinguish them and the one they worship from all others. These features are instantly recognizable. For instance, you hear the word “Hindu” and you think of a man in shorts, sitting cross-legged with hands resting on his knees, palms up, meditating on his trinity of Brahma, Vishnu and Siva. His deities, with their unique names, embody a well-defined worship, faith, and set of practices unique to Hinduism. Similarly, when you hear the word “Islam” visions of ornate mosques come to mind and turban-headed men on their knees bowing toward Mecca with foreheads touching the ground as they worship Allah and practice the dictates they claim are demanded. These and nearly all other religions have a worship that is consistent with the name of the one they worship. They would be quick to tell you that worshiping any other way in any other name is not worshiping Brahma…or Allah. The deity’s name invokes a unique regimen of worship. This fact should be self-evident. Closer to home, what comes to mind by the term Roman Catholicism? The pope is prominent here. But unlike other faiths, he and his followers worship a mighty one by the generic term G-o-d. They believe this unnamed mighty one requires a specific kind of worship as well, including the rosary, veneration of Mary and saints, Sunday worship, mass, sacraments and popular holidays. An offshoot of the Roman Church is the Protestant movement. Protestants worship the same nameless mighty one using the same nonexclusive title “G-o-d.” Nevertheless, they believe that their eternal one that goes by the same common title the Roman Church uses demands a whole different practice of faith. Although they worship the same “G-o-d,” more than 500 Protestant divisions don’t agree on that worship even among themselves, as they hold clashing beliefs and much different doctrines. Amazingly, few people ever give this profound oddity a second’s worth of thought. Worshiping under the specific name of an identifiable Mighty One limits one’s faith to a particular belief and practice. But attempting to aim an exclusive faith at a nonspecific mighty one, as churchianity has done, leads to today’s hodgepodge. In light of these facts it is critical that we ask, is the revealed, personal Name of the Heavenly Father important? Does it matter to Yahweh what you call Him? Does He need to have a name for proper worship, as the rest of the world’s faiths demand? Some say He knows who you mean no matter what you call Him. How many Bible believers would fall on their knees in times of desperation and call out to Vishnu? Or Baal? Or Zeus? How can one expect the one true Father Yahweh to respond to a plea to a false god? What about your name in the Book of Life? Does it matter if it is correct or not? You bet it does! You see, names do matter. Names do mean something, as any honest worshiper will admit. Names are definitive. In worship they identify and specify the one being worshiped. For all other faiths on earth the name called on points to a particular one who is worshiped in a specific manner and who (supposedly) responds in well-defined ways to a particular worship. But in a strange contradiction to this norm, Bible believers accept a common, generalized title for the true Heavenly Father they claim to invoke. And because only a nonspecific title is called on, widely divergent beliefs and practices can and do result. Does this make any sense in light of dozens and dozens of Scriptures commanding us to honor and call on His personal Name and follow only one true way of faith connected with that Name (Ephesians 4:5)? More importantly, how close is He to those who refuse His personal Name? Does He eagerly embrace those who have decided that a generic title is more acceptable than His revealed, personal Name – the same title found at the center of contradictory doctrines, beliefs and practices? Notice what the Apostle Paul said about this title: “As concerning therefore the eating of those things that are offered in sacrifice unto idols, we know that an idol is nothing in the world, and that there is none other Elohim but one. For though there be that are called gods, whether in heaven or in earth, (as there be gods many, and lords many,) But to us there is but one Yahweh, the Father, of whom are all things, and we in him; and one Master Yahshua the Messiah, by whom are all things, and we by him” (1Cor. 8:4-6). We in our Western culture have nearly lost the significance of names. Today “Johnny” is as good as “Tommy.” Even still we may be prompted to name our child after some beloved and admired individual with the same name. The good attributes of that person come through when we hear his or her name. Similarly we may reject a name for the reverse reason. All this from what the name brings to mind. Names are much more than mere labels when it comes to the Bible. All Hebrew names mean something. For instance, Joshua (Yahshua) means “Yahweh’s Salvation”; Nehemiah (Nehemyah) signifies “Comforter of Yahweh”; and Daniel means “El My Judge,” which accords with the character and contents of his book. The Name of the true Father we worship is particularly important because He tells us it is. Philippians 2:9 says His Name Yahweh is above every name. His Name reveals His special identity as the one true Mighty One of the universe. No other one worshiped has His Name. His Name brings us close. You don’t mind when a stranger calls you “friend,” or “sir,” or “ma’am.” In fact you expect an unfamiliar person to use such terms. But once you are introduced and you develop camaraderie with that individual, you would feel put off if he or she continued to call you the generic “sir” or “ma’am.” Your supposed friend would be rejecting the bond that using your personal name engenders. When making His all-important covenant with Israel one of the first things Yahweh did was to introduce His people to His personal Name, Exodus 3:13-15. He wanted and expected the intimacy that using His personal name would create. He called it His “memorial for all generations,” Exodus 3:15. He thundered to the prophet, “I am Yahweh that is my name!” Isaiah 42:8. Notice He didn’t say, “I am Yahweh, that is one of my names,” or “You can just call me whatever you wish, Isaiah, I’ll know who you mean.” He said specifically, “That is my Name!” Period. (“…whose Name alone is Yahweh…” Ps. 83:18). In the Scriptures when a person gave his name to another it signified the joining of the two in closest unity. When Yahweh gave His Name to Israel He was calling them to a marriage covenant, the closest union two can have. It is no different when a bride takes on her husband’s name. When she shares his name she becomes at one with him, both in aspiration, goal and commitment to a single cause – building a family. Yahweh is creating his own heavenly family with His people now, one day to be resurrected as a kingdom of priests, Revelation 5:10. We read in Acts 15:14 that Yahweh is taking out from the world a special people “for His Name.” He is making a family of Yahweh. “For this cause I bow my knees unto the Father of our Master Yahshua the Messiah, of whom the whole family in heaven and earth is named,” Ephesians 3:14-15. Biblically, the person and his name are virtually equivalent and inseparable. The word “name” in Hebrew is shem. Shem means a mark or a memorial – a person’s individuality. His name implies his honor (or dishonor), his authority, his character. In fact, scripturally a name describes and defines a person in all aspects of his or her persona. The Name Yahweh has great importance because of what it signifies. Intrinsic to Yahweh’s Name is the very verb of existence. InExodus 3:14 He tells Moses: “I am that I am,” or “haYah asher haYah” in the Hebrew. It means I am existence itself. I cause everything to come into being. His Name Yahweh describes Him, defines Him, and expresses His attributes as the one who causes us to exist in this life and the one who can give us everlasting existence, too. Joel 2:32 prophesies that the day will come when whoever shall call on His Name will be delivered. That meaning is central to the definition of His Name: “I am” or “I will be.” “Yahweh” also has the connotation, “I will be there (for you),” especially to be your deliverance. His Name is a family Name. His people, His very Chosen, are a family called by His Name: “O Yahweh, hear, O Yahweh, forgive; O Yahweh, hearken and do; defer not, for your own sake, O my Elohim: for your city and your people are called by your name” (Dan. 9:19). His people take on this wonderful Name because they are in covenant union with Him – obeying Him and pleasing Him in all that they do. His Name Yahweh is found an astonishing 6,823 times in ancient Hebrew manuscripts of the Bible. It simply cannot be ignored or dismissed. Is ‘G-o-d’ an English Form of His Name? A typical argument is, “I don’t call on Him by His Hebrew Name because I speak English.” Does a person change his name when traveling to foreign lands in which a different language is spoken? Or is his name the same everywhere he goes? Does he get a new passport with the corresponding name change at each new port of entry? Or is John Doe called John Doe everywhere he goes? Clearly, the name is the same everywhere. If names do in fact change then what would be the English equivalent of Vladimir Putin? It’s none other than Vladimir Putin. What is the English form of the Japanese Prime Minister’s name, Junichiro Koizumi? Why it’s Junichiro Koizumi, of course. No English equivalent exists because it’s not needed! Names don’t change in going from one country to another or one language to another. 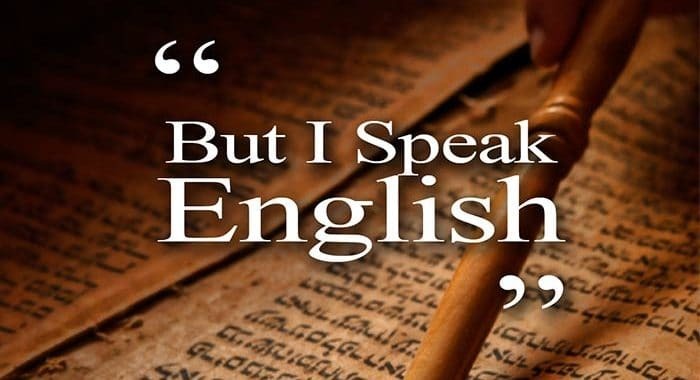 If the argument is, I speak English therefore I use an English name for the one I worship, then please provide the English name for Satan – because that name is Hebrew and it never changed in our English Bibles. Can you supply the English form of Abraham? This is another Hebrew name right out of the Hebrew Scriptures and carried over virtually unaltered into our English translation. One of the most popular words of praise is halleluyah. One hears it shouted out in churches all the time by those who have no clue as to its meaning. Halleluyah is one of the most ancient words of exultation in existence and it is pure Hebrew. “Hallel” means “praise” in Hebrew, and “Yah” is the first part of the sacred Name Yahweh. Therefore halleluyah means “Praise Yah”! The most common word of praise has our Heavenly Father’s very Name embedded within it – “Halle1uYah.” We usually see this word in the form hallelujah, but there was no “j” in Hebrew, Greek or English until about the 15th century. The “j” is merely an “i” with a tail and given a “juh” sound relatively recently. The “j” and “i” were used interchangeably in alphabets until the 17th century. Scripture records many well-known names that incorporate the name of the Heavenly Father. “Elijah” was not pronounced that way in the Scriptures. It was “Eliyah,” a name that means,” my El is Yah.” Isaiah (YeshaYah) is a Hebrew name that means “salvation of Yah.” Jeremiah (YirmeYah) is “whom Yah raises up,” Zephaniah (ZephanYah) means “hidden of Yah.” The names of many other writers and prophets contain the shortened “Yah” Name of Yahweh, showing the close bond they had to Him. If one sticks to the position that because we speak English we should not use Hebrew name forms, then we shouldn’t use any of the aforementioned, Biblical names, either, because they are all Hebrew names and we don’t speak Hebrew. It would not be right to apply that argument just to Yahweh’s Name and not to all the other Hebrew names and words in the Bible – like Sabbath, a Hebrew term, and Messiah, another Hebrew word. What about all the Biblical cities like Jerusalem, Nazareth, Bethlehem, and the names of rivers, seas, deserts, and mountains? These would all need to be changed to some English form to be consistent with the argument for the exclusive use of English. The problem is, there are no equivalent English forms for these Hebrew names! Neither is there a proper equivalent or substitute name for Yahweh’s great Name. Let’s pursue this point even further. For argument’s sake, let’s say that there is an English equivalent for the sacred Name Yahweh and that equivalent is “god,” with a capital G..
First, we must note again that “god” is not a name but a title. As we already read, Paul said there are gods many and lords many. There are also many presidents in our country – presidents of corporations, colleges, board presidents, bank presidents…but there is only one president of General Motors, only one president of Harvard, only one president of Citibank – and each has a specific, identifiable name that he answers to. If I wrote a letter addressed “Dear President,” it could apply to any one of these presidents. Only when I include the name with that title do I reveal the one I am actually addressing. If I pray to a god then according to Paul in 2Corinthians 4:4 I may be praying to Satan because Satan is called the “god of this world.” Myriads of other god deities have been worshiped by man throughout history. Is “G-o-d” an English form for “Yahweh”? Does He expect His people to change His Name to something else according to the language spoken? And is that even possible? The Oxford English Dictionary (OED) says “god” stems from the Old High German,got, deriving from the Gothic guthand going back to the Teutonic gudo, which stems from two Aryan roots – one meaning to invoke, the other to pour in the sense of a molten image. Call on god and you call on an idol, according to the origin of this word. Capitalizing it doesn’t change anything. speak = from the German sprechen. do = traces to Sanskrit which was spoken in India. In the statement, “I speak English so I do not use the Hebrew Name,” only one of those 11 words is in fact English. English is not by any stretch a pure language. Much of it is from the Romance languages and vast numbers of its words derive from the Greek and Latin (and ultimately Hebrew). Most of the words we use in English come from some other language! The point in all of this is that language has little to do with calling on Yahweh’s Name. He was Yahweh before He put man on earth. Before He created all these languages from Babel, He was Yahweh. “Yahweh” is existence personified. Psalm 135:13 says, “Thy Name endures forever, your memorial throughout all generations.” His Name is His memorial that endures for all time. The Ten Commandments in Exodus 20:2 begin, “I am Yahweh your Elohim which brought you out of the land of Egypt. You shall have no other mighty ones before me.” In the very first of the 10 Commandments Yahweh established right off the bat that, above everything else, He has an identity. If you don’t get that part right, everything else about your worship will fall like dominoes. We must above all else worship the right Mighty One. As we witness the general decay of Bible-professing religion and the perversion of all that is right and moral on this planet, we can go back to the very first of the Ten Commandments and see why Yahweh established Himself as supreme. We continue in Exodus 20:4: “You shall not make unto you any graven image, or any likeness of any thing that is in heaven above, or that is in the earth beneath, or that is in the water under the earth.” Understand that heathens didn’t worship a stone image as the stone that it was, but as a representation of some deity. Yahweh says don’t make these things because they will remove you from worship of Me, and I am the only one you are to worship. When we employ substitute titles for His Name we are in idolatry not unlike the pagan’s wood and stone. In the same way that an idol removes us from Him, substituting His Name veers us away from Him and the specific worship expressed by His Name and puts us in a generalized worship that is practiced by diverse and conflicting denominations. Moving on to 20:6 we are told to keep the commandments if we love Him and He in turn will show mercy to us. Now notice verse 7: “Thou shalt not take the name of Yahweh your Elohim in vain.” Taking His Name in vain does not mean to curse when you smash your thumb with a hammer. “Take” is the Hebrew nasa, meaning to lift or bring to. “Vain” comes from shoaw, to rush over, bring to devastation, uselessness, waste – basically it means neglect. When we trade His name for some title, we are breaking the Third Commandment. “You shall not bring His Name to desolation or ignore it through neglect,” the Hebrew behind the commandment says. When we use a common title in worship we are missing the most important aspect of who Yahweh is and what He stands for; what He is all about and what He will do for us if we would just follow and obey Him. His Name describes the very essence of who He is – Yahweh: He is existence personified. When you call on the Name Yahweh you are invoking the only true, active, all-powerful, majestic Being in the universe. Most people would prefer a nameless mighty one who, like a kindly old grandfather, is there to bail them out when needed but who otherwise is absent while they live out their lives any way they choose without hindrance. Much better for them to keep Him nameless and in the shadows and not make Him too real through the calling on a personal name. Perhaps this is the underlying reason His Name is so often avoided today. Do we have such little respect and regard for our Heavenly Father that we would deny Him His own Name and call Him whatever we please? Our prayer is that you will grasp the critical importance of the truth presented here and come to know your Creator through His personal, covenant Name Yahweh, the only Name given to us for salvation, Acts 4:12; Joel 2:32.